On 28th December 2016 at around 10.30pm my plane touched down in Delhi and this new life that i had been planning for for six months was finally beginning. I had some kind of idea how i thought life might end up looking but at the same time had no idea how it would all work out or i guess, if it even would. 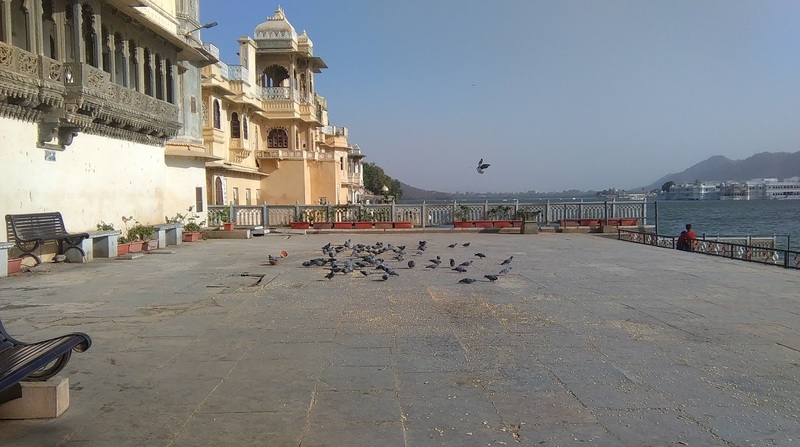 So a year down the line, a year of living in Jaipur and making India my home, what are my reflections and thoughts on the whole thing! I think you never know what to expect when you move somewhere new, never mind to a completely different country. I think you also, or rather i did, have these notions that i was completely starting again and would be closing that chapter on my old life and it would completely begin again, instead it has been both a merging of the two countries and old ways creeping back in. For example i never thought i would return to the UK at all and yet i went back in August and i ended up doing some massage work for three weeks which was a huge help to me and something i plan to continue doing a couple of times a year. So having the best of both countries which is an unbelievable privilege. 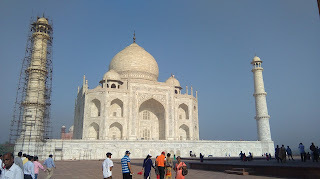 Firstly where did it all begin in India and how do i end the year. 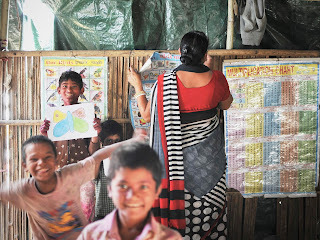 At the beginning of the year i started teaching in a slum school. When i came out here i wasn't sure initially what i would be doing for the charity but as one of their teachers had left it was a natural progression that i would step in to the role. I then began to teach the children in one of the slum schools and was staying in an annexe attached to the apartment of the guy who ran the charity. I had this vision, that i would learn to cook Indian food and go out with friends and learn Hindi and keep working with the charity and making a difference. Beyond that I hadn't thought too much of how it would all look. How it looks now!.....I no longer work for the charity, after 8 months of working hard for them and putting up with a lot of issues I decided it was time to move on to other projects. I'm ending a year in India with having set up my own massage business. I began creating it back in March but did not begin to set it up properly till September after i had spent a month in the UK obtaining a new visa. I'm ending the year with my massage business up and running and I do massage work for around three hotels. It's a slow progression but I'm managing to end the month with a little bit of money left over for the odd treat and it's a great feeling to know I have hit self sufficiency. I hoped to end the year working in social causes as that's why i came out here and I'm happy to say that along with my friend, we are setting up our own NGO and so social causes are still important to me. I also help out and have links with several other NGOs here and am dabbling with the social causes here and there and so am still very much actively involved although perhaps not the way I had anticipated. I guess that has been one of the biggest changes, as i came out here to work for that particular charity and anticipated putting in maybe two years for them. When i left the UK i also had no plans to start massaging again or only a little bit here and there. I didn't envisage that living in India would be so difficult or how much i would be affected by not working and earning money. Mentally it began to play on me and massage is a real passion of mine so i was really missing it. I also think i expected to find paid work or spend less than i have. I've always been careful with my money but I found out India is not as cheap as you first expect it to be. So i end the year doing a different job to the one I first thought i would be doing but i feel that what I'm doing is right for me. It's also exciting trying to bring remedial massage to India and to be able to help people. I also end the year with a wonderful bunch of friends who i know i can rely on and who mean so much to me. They make me smile and their people i can count on and who have helped me out so much. I guess i never thought i would find my place or people and I've realised not only am I at home in India, i have a lovely bunch of supportive friends who i can count on. I have a wonderful partner who is kinder than i could have imagined and who puts up with my weird ways. I get to work with people that are getting used to my strange British behaviour and am creating a strong hold here. I don't cook as much as i would like but that is largely to always being so busy working on numerous things as i try many ways to make a holding for myself here. I do enjoy baking though although a lot of that I do for friends. I'm still learning Hindi, that has quietened down a little over the last few months as i focus on work projects but i still try to study at home and not only have i managed to keep this up but i really hope to be semi fluent by the end of 2018. It's pretty cool ending the year being able to converse with people a little and every day i feel like the language is clicking with me more and more. When i moved out here i also had this rather daft notion that i would get mahendi done regularly and wear lots of Indian clothes and live a very Indian life. I think that was a naive view i had and I also realised that things i began doing in the beginning in an Indian way, slowly got changed back to some of my old ways and i don't mind that. I feel like i am finding a way to live in a new country whilst still being my own person and finding my place with that. It's hard to believe a year has passed and it has been a tough one. Fortunately it has been one where you don't realise how tough it is until you're reflecting back! It was tough though but it was always going to be. When you swap an easier lifestyle for a more complex and challenging county that's exactly what you're going to get and although sometimes i wish it was easier, I always thrive on the challenges. That being said, i think i never envisaged it taking so long to get so many things sorted here. For example it took me six months to try and set up a bank account and i only managed that due to a friend! Honestly, my friends and i tend to rejoice when we manage to get something sorted out and it's not actually difficult! I guess i never knew what to expect my life to look like after a year. As i say, i think i envisaged still working for the charity, spending time with those colleagues and being part of the family and living a very conservative life. Where i find myself, is having set up my own business, earning enough money to get by, having a good group of friends who are supportive but that i can have fun with, being actively involved in social causes and setting up an NGO and having someone who makes me laugh and happy. More importantly, after a year, i basically just feel at home! It is my home. I continue to still be challenged, shocked and learn new things all the time but it's a place i feel i need to be right now. As for where i see myself in a year's time, i hope it's not too different from now, but only better as right now, I'm super happy and I'm living a happy life. Wow! 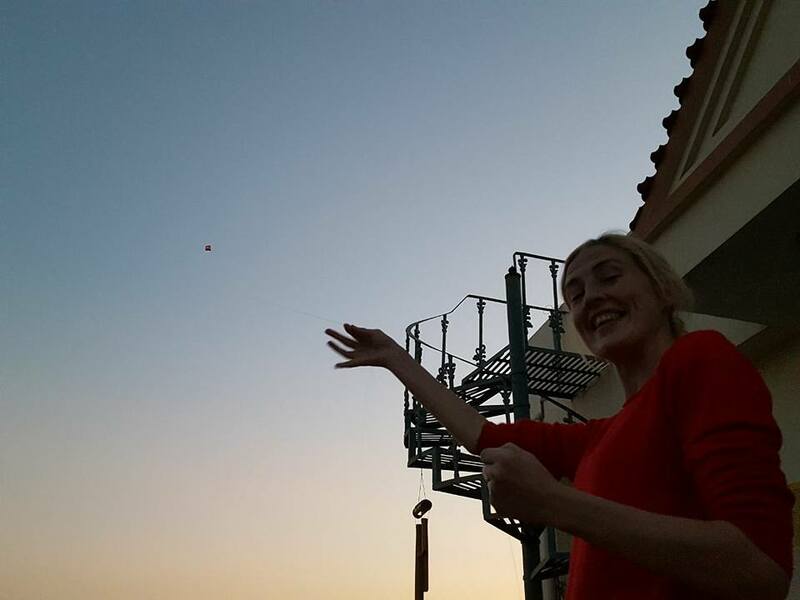 It's been such a long time since I last blogged and so much has happened since then! I knew life in India would end up busy but i never realised how busy! So rather than me writing a huge long post detailing everything that has happened these last several months, I'll give you some bullet point snippets. I left the charity i was working at in August. It was no longer working out for me and the owner and I are simply two very different people with very different ideas. I went back to the UK for a month from end of August to end of September. 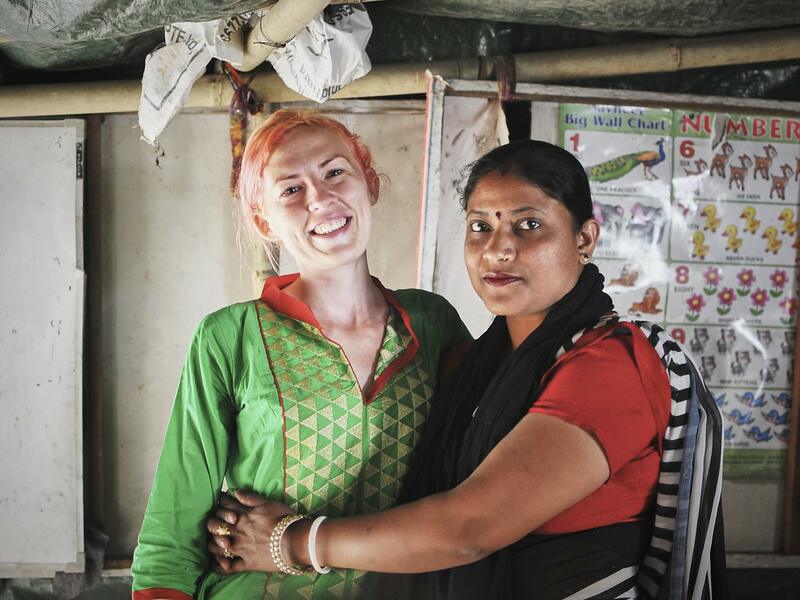 Whilst there i changed my visa and was fortunate to get a 5 year business visa for India in order to work on my massage business and other social causes. 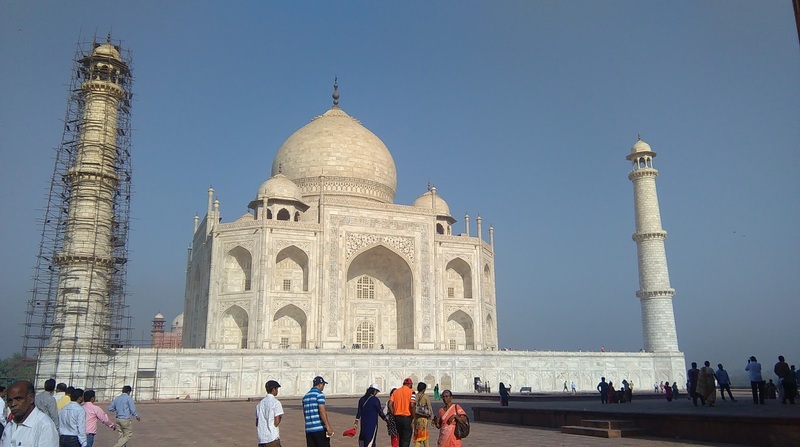 It was a stressful time applying for the business visa as I wasn't sure i would get it and there was the fear that if I didn't, how else would i get back to India. I had a wonderful time catching up with friends and family whilst i was back, enjoying peaceful roads without cars pulling out in front of you and home comfort foods. Whilst it was a lovely experience it was great to return to India where the real fun began and i have had a steady stream of massage clients ever since! I've made connections in a couple of hotels and am enjoying getting back to some massage again. I and my Indian brother are working on creating our own NGO which looks at upholding legal issues especially relating to the environment, elderly and disability. We're in the early stages but work has begun and we have a lot of work to do in front of us. I set up a volunteer scheme with one of my dearest friends and we have some work to do to get that up and running but once it takes off it will help many people. I've been making new friends and socialising. I've been up to the Himlayas and had a lovely break away exploring Himachel Pradesh. I've been working on making home more homely and a place that i want to be at for the next five years. 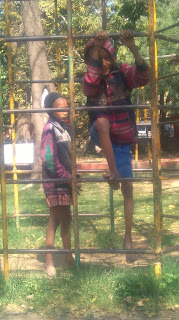 So, as you can see, it has been a busy time trying to set some good foundations for this next stage of life in India. 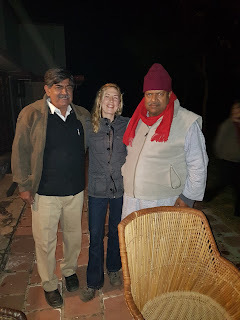 I've continued with my Hindi studies and have tried to do a bit of cooking here and there, but both have taken a bit of a back seat as i have tended to be focused on other things that needed doing. Things are going to continue being busy for some time....but it's all part of the fun in India! Plus my mum and sister are coming to visit in just under two weeks, so it will be an exciting time travelling around. So this coming week is an interesting one as it marks six months of living in India and six months working and volunteering with the kids in the slum. As is usually the case, in some ways it feels like I have been out here forever and in others it's hard to believe that I have known these particular kids for six months. I've always had a great relationship with them and they have been warm and playful with me but these last six weeks the children have become much more affectionate towards me. They love to come and snuggle up with me and give me hugs and hold my hand. 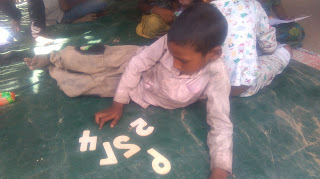 Recently we played a game of shops, where the children had to try out their money handling skills and counting. It was great fun and made me laugh as so many of them wanted to buy me things from our shop because they didn't want me to do without. It's also funny to look back at some of the children and see, not only how far they have progressed but how much they have changed as children. There are a core bunch who come almost every day and who, as time has gone on absolutely love coming everyday, they try hard and want to learn and you realise how much their behaviour has improved. They no longer want to climb the school walls or constantly fight, in fact the only children who do that are the ones that rarely come to school but come every now and then so have not learnt how to behave or respect our new school rules. 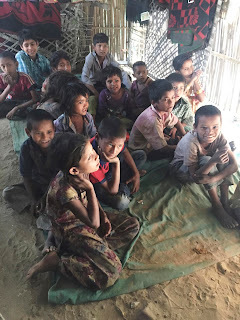 When I first started, these kids weren't particularly interested in coming to school, where as for the last three or four months they will come running to school and want to know what we will be doing that day. They will actively ask for work. 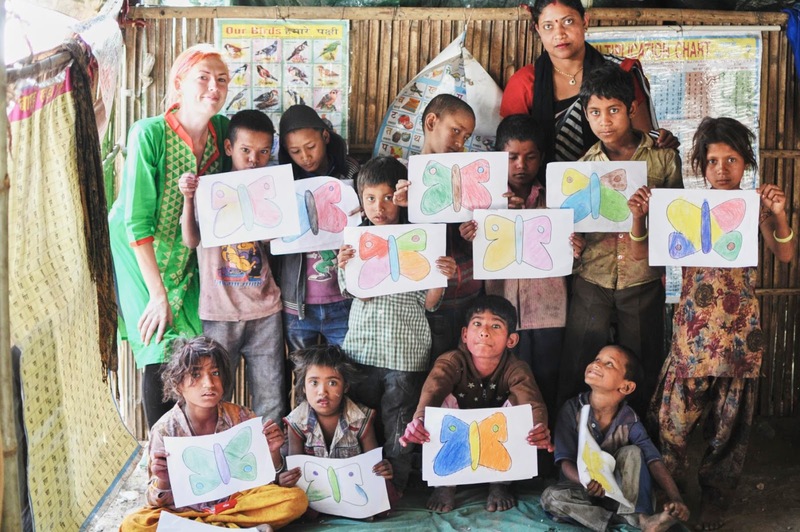 Recently I have been teaching them how to write their name and the big challenge next, is teaching them how to read, which is going to be tough considering I only know some Hindi myself, but teaching these kids to read could open up a whole new world for them. Their counting has improved, as has their social skills and creativity. We have been teaching them a little English to help them get by and we have been teaching them through so many different methods, from pretend money to playdough, to making music out of old bottles, to counting using a ball, to learning the alphabet through snap games. It's hard to believe we have been working together for six months and the impact and importance they have on my life. I absolutely love them, they are a joy to work with and when your having a crappy day, that look of recognition and happiness on their face as they walk into school and see you is priceless. 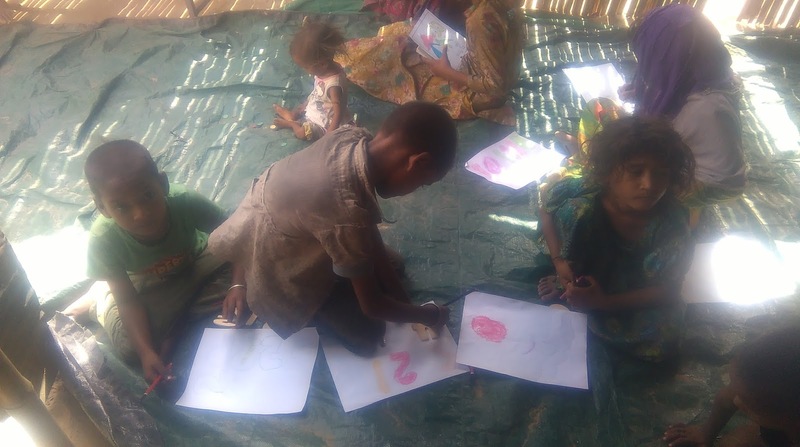 These children make my day and I hope in some small way, I make theirs too because I can't change their situation and the life laid before them but I can help to give them an amazing experience now and if I can teach them something that will improve things for their future, so much the better. So at the moment it's a bit of a strange situation, equally frustrating as well considering i was signed up to do a ten day Vipasna course, however i am currently without my visa or passport! The joys of Indian bureaucracy means that despite starting the visa process two months early, because of how difficult it is at the Foreign Region Registery Office and how they change their mind so many times, i still only just got my paper work in on time. My visa was due to expire on the 29th May and i was able to get it to them for the 25th May, result?! No! That's when they inform me that they will be sending it to the Rajasthani Government and it will take up to a month!! So that means no travel, no going anywhere and no staying anywhere else. Which meant that my Vipasna course had to be cancelled. It's kind of a crazy situation that makes me smile, that at this point in time i am in no man's land, unable to travel or leave the country and yet no official paper work to say that i am allowed to be here. It's kind of funny and typical of the situation out here. It was a pain in the arse due to the fact that my mobile and internet have been cut off due to not having a current visa but as i have come to realise in India, i have good friends and they have sorted out my phone and internet issue for me and got me the necessary sim. You have got to love Indian bureaucracy though because at the same time as applying for a visa extension the head lady there told me to apply for registration for my residency permit which i did. The thinking at the office was hey we will give her a residency permit for the 25th May when she put in the paper work until the 29th when her visa expires!! Like i want a piece of paper for four days. Common sense would tell you i was applying for visa registration to go along with the visa extension but no apparently common sense did not register with these people. So all the paper work i put in will have to be submitted again for the second time and knowing this scenario, i will have to pay a fine for applying late due to the fact that they have my visa......got to love their system! Hopefully it will be back with me soon and that will be paperwork complete for the next year with regards to the visa and i can go stay in a hotel or take a train without any problems. Got to say, it makes you realise how difficult it must be for people when they move to the UK and the frustrations or complications people face because they were not born in a specific country. It's still all worth it though and i'll glad when the passport is back as i am in need of a little break and it is time to go and explore some of India for a few days or head up to Spitti to escape monsoon when it comes. 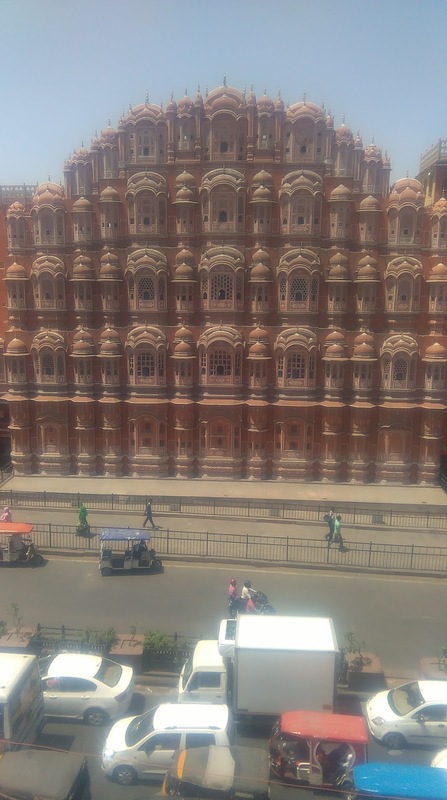 In order to get there though we have to go through the old part of the city, with its beautiful pink buildings, with Hawa Mahal and it's breathtaking facade, with vehicles pulling out in front of you in all directions. It really is a unique experience! Firstly, the journey starts with us sharing food because in India everyone shares food and what food is someone else's is also yours. So munching on our paranthas and sabze we set off! 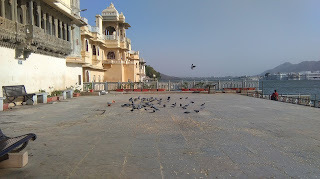 As we try and make our way through the old city, we see the monkeys coasting along the pink rooftops, see cows just decide to wander in to the street and as we continue to Amer we pass camels finishing their days work at Jal Mahal, better known as the palace on the lake. The two guys I went with are really great guys and along with our other friend they make me realise that although India may have somewhat of a reputation with regards to guys and them not knowing how to treat women, there are also plenty of men who are defying that stereotype and show such courtesy, respect and friendship. 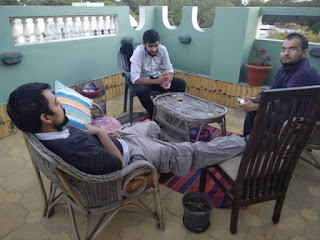 I enjoy hanging with these guys and spending quite a bit of time with them and being shown a different side to Jaipur that only a local would know, which goes for enjoying street food or finding the best places to shop. These guys are a wealth of information and their good fun too! The light and sound show was fun and interesting all at the same time and made me chuckle! Firstly, we missed the English performance because we were late as is typical Indian style, however we were able to make the Hindi performance which comes after. Now, I hear Hindi all the time so was happy to watch the performance even if I couldn't necessarily understand it and fortunately my friends could translate. As the performance started at 8.30pm, the back section was full but the rest was empty, however 15 minutes after the start, it begins to fill up with Indian people in all their lateness and 25 minutes in to it, I would say the last few people had arrived for the show, which was now almost half way through. It made me smile and think of how India is on its own time, of which these days I am definitely into my Indian time keeping and need to get better at sticking to the correct time again! Finally - It's too hot! I have coped pretty well with the heat up until now, even enjoying it and because I am tight, not putting the fan on loads in order to save electricity! When i lived in the UK I would scrimp on heating and now the situation is the reverse! Have to say though, it is easier being hot than it is being cold! I really don't miss the cold, I used to hate it! 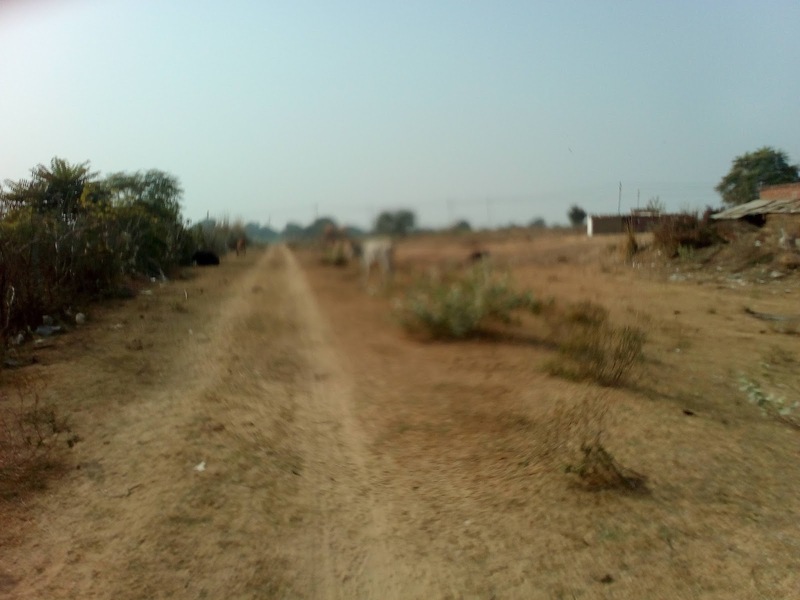 However Friday was the day when it really hit me, as I sat in a heap at school, telling the children 'bahut garmi' meaning too hot, as i waved them away. 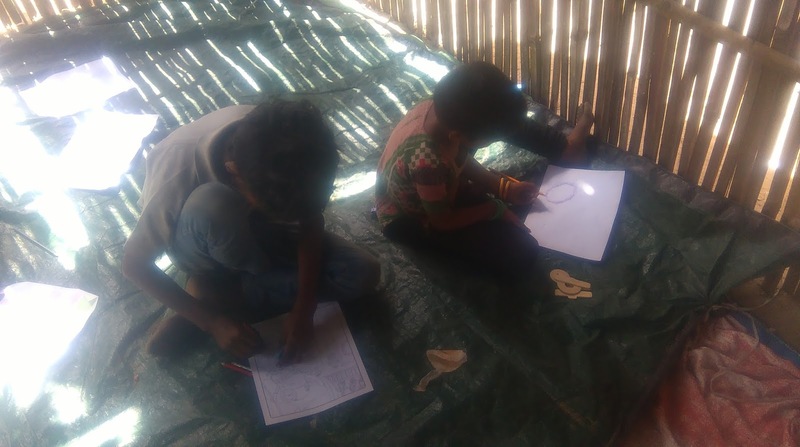 We all sat in heaps on the ground, having endured already two months of temperatures in the 40s and no fan within our make shift school, so no means to cool down and sweating profusely! I finally have to relent and say that i am too hot! The woman who loves the heat wants it to cool down now! There are many things in the pipeline at the moment where are a bit too new or too in the early stages to mention just yet, but they are keeping me exceptionally busy to the extent that this is a short blog post before I go and crack on with many jobs whilst making time for Hindi homework. It is good to be busy but this is super busy and I have so many people to liaise and meet up with but it should lead to my end goal of being able to stay out here permanently, so it's all good. As a result though I have been far too busy to get up to much, including not really celebrating my birthday. So today's post is going to be about the children as work with them continues as always. Recently I have been working on teaching them their name as it bothers me that they can neither write their name in Hindi or English and many of them can't even recognise their names amongst three other names. I think being able to write and recognise your name is so important as it gives a sense of identity and increases self worth when you can write your own name. The children have been loving it and most are doing really well with it that we have moved on to writing some basic phonics and making sure the children actually know what they are writing, so that they recognise that 'cat' is cat and not dog. The children love doing their phonics sheets and I am beginning to question how I can start teaching them English, which is something I have not done until now. 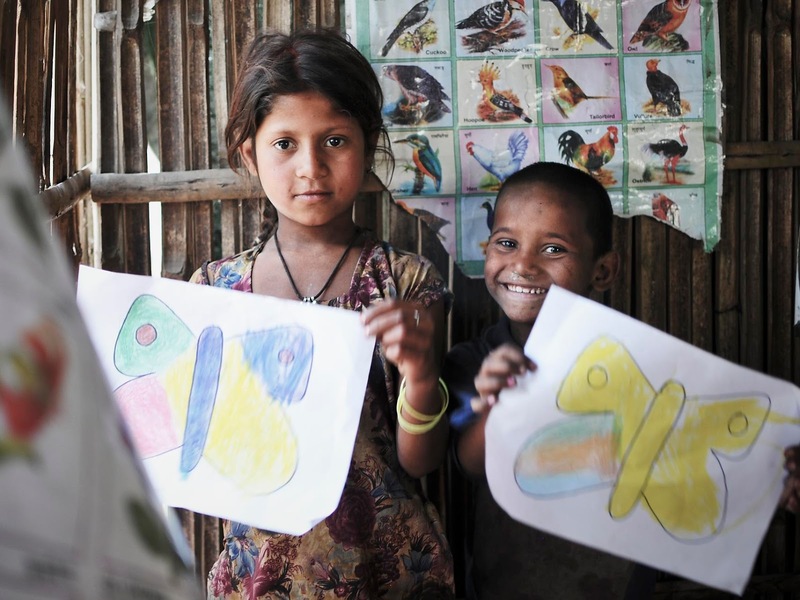 Up until now the focus has been getting them to come to school, trying to get them to recognise the English alphabet then working on their counting, working on recognising shapes and colours, all of this is done in Hindi and I am slowly trying to teach them it in English too. They are complete beginners when it comes to learning English and so it is hard to know where to start but at the same time, I see great potential with them. Some of these kids are so lovely and actually pretty clever, had their situations been different and they were born into easier and more pleasant circumstances. Therefore I want to help them be the best they can because some of them are young enough to want to do well and to really focus on it and at the end of the day, every little bit does help them.For once these children are enjoying school and they tell us that and more and more kids come to school each day despite the heat. It's not unusual for us to have 20-25 kids there. Children who never used to come to school are coming every day and asking for you to give them school work. With exception to the heat and dust at school, the easiest part of my job at the charity, is working with these kids. However after a rather random journey to my friend's house last night that should have taken 20 minutes and resulted in the Uber moto getting lost, wanting me to speak on the phone to half his family and making numerous comments that bordered on creepy or just plain stupid, it reminds me that India has so much still to offer and I have so much still to understand! 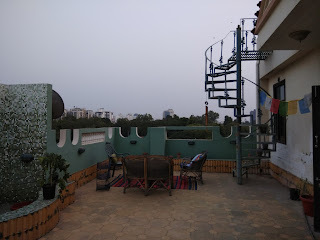 It did make for good entertainment when I got to my friend's house and having had to speak Hindi on the phone to the driver to explain her location, she had also come to the same conclusion as me! On the other hand, I am loving the Uber moto's! The chance to be on the back of a bike, which is where I prefer to be. My brother had a bike when I was younger and I used to love being on the back and riding on the back of a motorbike is always more interesting in India! I made the right decision! Sat with my friend last night, keeping her awake for several hours putting the world to rights, I realised how settled and at peace I am here and how fortunate I am to have amazing people around me. I sat there happy as we discussed plans for the future and I realised despite some of the battles I have experienced here, I don't regret my decision. There are some random people out there who can be difficult and have absolutely no common sense.....and then you meet some amazing people that you are fortunate to call friends. Whether it's the guys I work with at the hostel that show me that there are young men here with innovation and business minds who have a different way of thinking and kind hearts to my female friends that I laugh and joke with and find cultural barriers broken with and friendships that define social and cultural norms. Some of my friends are people who speak almost no English and I speak little Hindi and yet there are connections there. That having an Indian brother is the best! Not only do they have to take all your joking and messing about, they have to be there for you and solve your problems! As my Indian brother said at the beginning of our relationship, 'I'm not sure I want a sister, it's a big responsibility and it means I always have to be there for her and help with anything she needs'. Fortunately for me, he takes his role seriously and is one of my biggest helps and my dearest friends and I really am honoured to call him my brother, I would have struggled without him. Street food is amazing and thanks to the guys I work with I am finding so much about the different street foods and getting to sample them. Yesterday we had Dal ki Kachori and I am so going back for more of that! I am going to be a street food connoisseur in no time! Things really do take time to happen.....for someone who struggles with time and patience, it's been a big lesson! After five months of being here and trying so hard to explore work opportunities it has only been this last month where work situations have really begun to open up. Not just work opportunities but life is becoming more full thanks to the connections I am making and the people coming in to my life. Since I got here I have been trying hard to set up some kind of work and especially my massage work as that's what I love but this last month has seen so much change. From getting a content writing job for a hostel blog, to a new volunteer partnership scheme that we are in the process of creating to other possible work opportunities and finally some responses from hotels in the area to the possibility of massage work. We shall see where it leads but it feels like someone has hit the accelerator pedal and life has become super busy and full of opportunities. It comes at a good time as my ultimate goal is to become self sufficient in India. 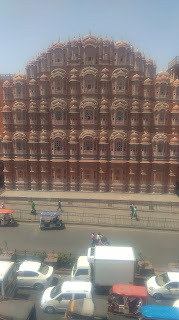 I still have so much to learn about Jaipur and the culture here never mind the rest of India. India truly is so big and each state is like another country and whilst I become aware of my city and state, I have no awareness of the other states. I try to understand and comprehend the social, cultural and gender situations but there are many times I am told things that I just struggle to comprehend or get my head around. I struggle with the fact that people pass so many judgements, whether it's the fact you have too many cups of tea or how you have your hair to every decision you make in life. I try and fail to comprehend some of the choices people feel they have to make or the line that someone can not do something because it is not acceptable in society, I guess because I was fortunate to grow up in an environment where my mum did not imprint her values on us and allowed us the freedom to be our own person. Thank you mum! People like to do things last minute, I have got to learn to go with the flow. It is very common for someone to get in touch with you and say 'We're going out in an hour' or 'let's meet in a few hours' or 'I'm just coming round'. Planning is less likely and you've got to be prepared for any possibilities and that whilst in the morning you may not have had plans, by the evening that may have changed! Don't be afraid to approach people! Due to still having a long way to go with my Hindi I have no problem with going up to complete strangers and asking them to speak to Uber for me as I thrust my phone in their face. I've also learnt Uber prefers it if you phone them in order to make them come! That's not going to happen for me anytime soon, especially when Uber drivers can not work out which language I am speaking in as I mash Hindi and English together in some garbled tone! I'm tight, even in comparison to Indians! Now I have always been a saver and if you ask my family they will tell you I have always been tight! I like to see it as being careful with money! I prefer to buy all my clothes from either charity shops or on Ebay rather than ever paying ridiculous full prices. I would prefer to use coupons or offers and experience a bargain and spend only when I felt it was needed. Now I would always pay for my massages or osteopathy treatments as I have always believed it's important to look after the body, but I was never interested in eating in that expensive restaurant or going to the five star hotel. I'll try and save money where I can and that works great here and I'm getting as bad as some of my Indian friends when I start shrieking and asking them how much they paid or congratulating them on a good bargain. I love being around bargain conscious people! Asking for help. When I first moved to India, I tried to do everything for myself especially when it comes to buying things or finding out where to get things from. This was not only time consuming but as many people point out to me, not everything can be found on google. 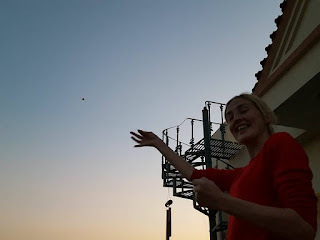 As time has gone on I have loosened my grip on Google and Amazon and turned to friends for help instead and found out life is easier that way. In the UK I was used to being completely independent but India has taught me it's not about losing your independence but realising what a wonderful support network you have with people happy to help. Lastly, India has a love of bureaucratic paperwork, as I continue my hair pulling experience of getting my visa extended. My bhai and I have spent almost two months working on the visa process and my visa is due to expire in a week and we are hopefully, finally, almost there! It's taken the creation of so many documents, that were checked and then checked again only for faults that were fine the first time to suddenly be found. Once the visa is finally extended and my biggest stress completed, next up is sorting out my sim card for my phone and my internet, both of which are due to be cut off due to my visa expiring and we will have numerous bits of paper work to sort as a result of that. As my friend said, with all the dramas over the visa, difficulties at the charity and then the phone and internet to sort out, do I not think about going back to the UK. However you can see these difficulties as obstacles or opportunities that challenge you and prepare you. I always believe in life that you should have the strength to stand up for what you believe in and to live the life you desire even if it goes against society and those around you than to deny whatever it is that is important to you. Plus this time round, maybe I'm getting used to the Indian way of things and I'm not half as frustrated by it as I once would of be. India definitely leaves it's mark, but it also leaves enough scope for me to continue being me, defiant and feisty to the end!